Giovanni Battista Falcieri, known as Tita, was a gondolier in Venice when he first entered into the service of Lord Byron in 1818. He became personal attendant to Byron and followed him through Italy and to Greece. He was present when Byron died in 1824 and accompanied his body to England. After Byron's funeral he stayed in England and became a valet to Byron's friend John Cam Hobhouse. In 1825 he returned to Greece to join the War of Independence. By 1828 he was back in England and worked for James Clay. He joined Benjamin Disraeli on his tour of the Orient in 1830-1831. Between 1832 and 1848 he worked as a valet for Isaac Disraeli at Bradenham Manor and he married Disraeli's maid Sarah Harvey (1806-1877) in 1849. After Isaac Disraeli's death in 1848, with the help of Hobhouse he was employed as a messenger to the government at the India Office. 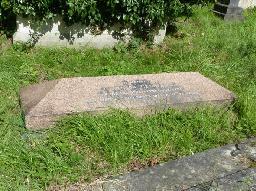 When Falcieri died in 1874 he was buried at Kensal Green Cemetery. Disraeli recommended his widow to Queen Victoria for a pension from the civil list. She obtained it immediately and lived in Marylebone until her death in 1877. The grave of Giovanni Falcieri at Kensal Green Cemetery, London.